The title to this post may be a bit misleading. I am not using the term “non-believer” for those who don’t trust in Jesus Christ, but for those who don’t trust, believe, or subscribe to any kind of faith, religion, or creed. I am talking about the creedless. I am talking about those who say they don’t believe in anything. In their book Rooted, Cannata and Reitano cite a poem called “Creed” written by Steve Turner. In this poem, Turner insightfully captures the creed of the creedless. This is what the non-believers of our day believe. This is the creed of the creedless. The beliefs of the non-believing. 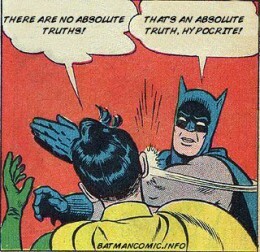 The absolute truths of those who reject all absolute truth. The emperor is naked, but no one seems to want to admit it. This entry was posted in Uncategorized and tagged apostles creed, belief, believers, creed, non-believers, postmodernism, rooted. Bookmark the permalink.